OneHeart productions is an innovative nonprofit arts company founded in 1999 by a team of artists committed to create theatre that is raw, alive and vibrant. The mission of our company is to create work that frees the spirit by exposing the totality of the human condition. We produce plays, films, and educational workshops that seek to inspire, challenge, and enlighten. Through long-term collaborations with theatre artists in New York and abroad we create projects and programs focused on community building, reconciliation, and the expansion of human consciousness. The Revelation Theater Program uses theater performances to support healing and reconciliation efforts between populations historically in conflict. We work with actors that are members of populations in conflict (including victims, perpetrators, and their descendants) developing theater projects aimed at breaking the silence about the conflicts they have inherited. Intimate Relations looks closely at the impact of the Holocaust in the lives of non-Jewish German women and American Jewish women who are third generation descendants of perpetrators and victims. We worked with actresses in this demographic and explored autobiographical material from their lives through carefully designed, intensive, performance-based workshops over a three-year period. The material gathered yielded two full-length plays: "Luna's Bracelet" and "Searching for a New Sun." We presented these plays in Berlin for the first time in the summer of 2010 and will be staging them in New York in 2012. The Slavery Project examines the long-term impact of slavery on race relations in America. Our aim is to look at how the history of slavery, segregation, and desegregation affects the lives of black and white descendants of slaves and slave owners today. This project involves a collaboration with established playwright George E. Joshua, who has written "Birmingham Reunion," a riveting full-length play based on personal autobiographical material from the actors' lives. OneHeart is gearing up to stage this play this spring. "The Love of Brothers," written by Mario Golden. 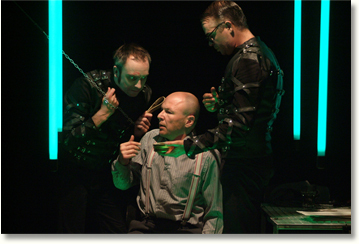 Plays directed by Andreas Robertz at the Artheater, Cologne, Germany. "The Pillowman" and "Secret Society."